I woke up this morning and had this weird feeling in my stomach that you get when it’s Sports Day and you’re really rubbish at every single discipline. 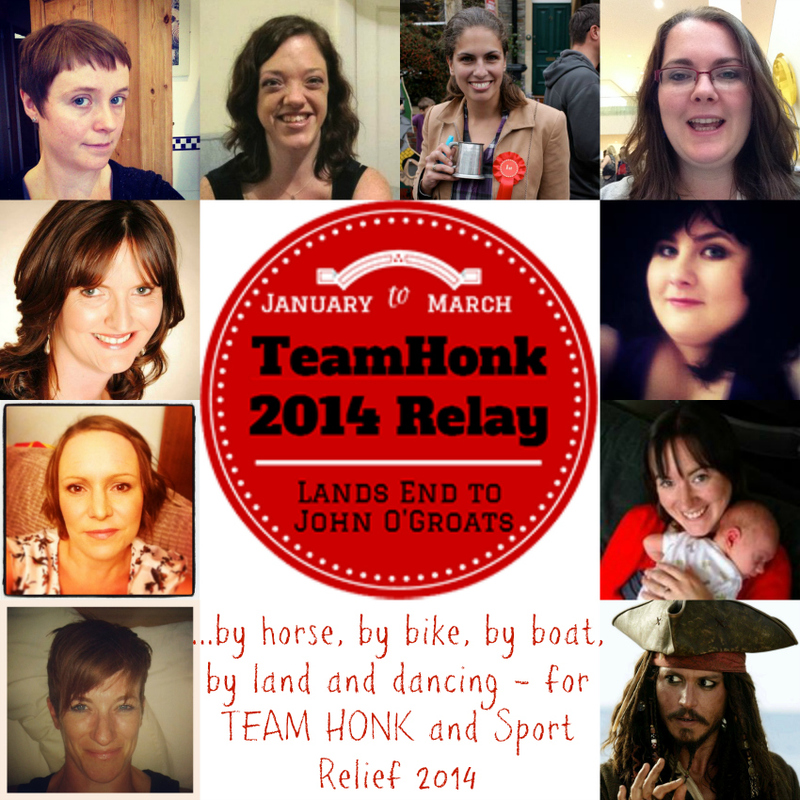 I know this feeling really well, because I sucked at everything that wasn’t volleyball, shot putting and swimming, yet I have decided to sign up for this year’s Team Honk Relay to support three of my favourite bloggers in their attempt to raise £20.000 for Sport Relief 2014. On Sunday, (this Sunday, in only two days, 9th February 2014, without any form of training and a non-existent fitness level, I will be making my way to Chipping Sodbury with Jen from Instinctive Mum and Emily from Tealady Mumbles to pick up the baton from Team Oxford and then walk back into Bristol. I might be saying ‘back’ in a rather casual way, but back means a whopping 14 miles. Just to break that down for you, 14 miles equal 22.5km, 22531m or 56.3 athletic tracks. That’s 56.3 athletic tracks more than I have run or walked in over 10 years. 14 miles might not be much to you, but it’s kind of a big deal to me. See, I don’t really do the whole exercise and fitness thing anymore. 10 years ago, I had an accident during a school sport lesson and since then my right foot has never been the way it was before said PE lesson. I had to have surgery twice, one procedure seeing me have a bone transplant from my knee into my foot and another one creating artificial ligaments. Both times, surgery put my life on hold. I wasn’t allowed to walk for 6 months after each operation and it was just a pretty dark and depressing time of my life. I can walk fine now, but long distances are tough as are hills and unsurfaced paths and roads. So yes, Sunday will push me, really push me, but I’ve always been stubborn and I will carry the Team Honk baton into Bristol – even if it’s at midnight and I’m crawling into the city. You can motivate me along the way by donating via the badge below. Every pound counts and we would be incredibly grateful to everyone who supports us on our three day fundraising extravaganza – more on day 2 and 3 soon! You legend! I totally did a double take at Jack Sparrow then too! Ha, I love that you sneaked in a sneaky pirate… Joking aside, amazing team effort and the whole Team Honk Relay has been AMAZING! Why is the rum always gone? Think you might need some dutch courage! I’ve no doubt that you will be as Epic as always – am rooting for you and hope the weather is fine! Good luck to you! Sounds like it’s going to be a real challenge for you. I’ve trained for my leg and it is a challenge, but I know I can do it. Yours sounds so much more challenging. Really hope you hit your fundraising target.